The death toll in Thursday’s violent unrest at the Georgetown Prison has risen to 16, even as authorities said calm has been restored to the maximum security facility. Guyana’s Public Security Minister, Khemraj Ramjattan said the incident was also engaging the attention of President David Granger. Earlier, one of the prisoners died at the Georgetown Public Hospital Corporation while the bodies of the others were found and retrieved at the prison itself. Five others who sustained serious burns about their bodies were taken to the hospital for emergency treatment. Sources said the prisoners broke up the wooden beds and also armed themselves with pieces of steel that they used to “harpoon” prison service personnel who attempted to quell the unrest regarded as the worst in Guyana’s recent history. “When, with the smoke and the fire in there, they were trying to get them out, the prisoners started harpooning them. They broke up the bed in pieces and started ‘jooking’ up the prison officers and so they had to back off. I don’t know what is happening in there but it seems to be extremely serious but it is under control,” the source told Demerara Waves Online News on condition of anonymity. Investigators said several of the inmates appeared to have died from suffocation caused by the thick smoke. 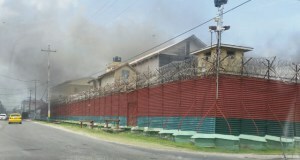 At the time of the incident, a number of them were being moved from the area where the fire started to another area when a number of the prisoners resisted prison service personnel, slammed a door and prevented a number of the convicts from being affected by the smoke. In addition to the discovery of several prohibited items such as cellular phones during a search of the jail Wednesday, authorities said the prisoners have been demanding their freedom. The fire was set in the ‘capital’ offence block where a number of persons convicted for murder are held. A number of the inmates Wednesday night and during the pre-dawn hours of Thursday attempted several times Wednesday night to burn the prison. be useful to them on release. centres deep in the Amazon. bad apples will spoil the whole crate. learn from the mistakes of past. dem a tief inside de prison lock-up. prison than 5 * hotel. Yes and we have the same kind of corruption here… in Canada. It exists everywhere on the planet. How it is addressed is the question. a necessary evil we must live with. must change if the result is to be different. Guyana Canada USA UK EU no difference. By sharing info is way forward.